She was born in Coventry on 27 February, 1848, to actor parents of Irish descent. She had few childhood recollections that stood out and suffered from what she called, ‘A bad memory’! She described one fond memory of falling asleep nightly holding her father’s hand and said she was, ‘her father’s pet’ or family favorite! Being a sibling of nine children, I could see as that would stand out in a person’s memory. When it came to her mother, Terry described a woman who did not shrink from her duties, who worked hard at her profession and raised her children to be healthy, happy, and theatre-minded! When her parents were performing on stage, her mother would bring them to the theatre with her wrapped up in a shawl and let them sleep in the dressing room. So, you could say the theatre and the need to perform on stage was in her blood! For instance, her first childhood stage performance was in a pantomime, ‘Spirit of the mustard-pot’. She was chosen because they needed a small child who could literally sit in a pot and was small enough to fit inside it. 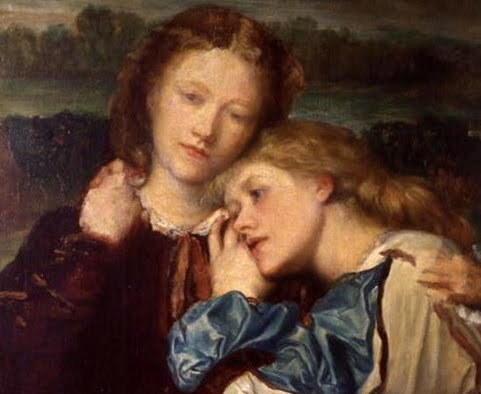 Two years later, in 1864, Ellen Terry and G.F. Watts were married. Terry was now sixteen and Watts was forty seven. Although, young in age she insists that she had her parents blessing, ‘It all seems now like a dream – not a clear dream, but a fitful one, which in the morning one tries in vain to tell’. It is interesting to note, that she records crying for most of her wedding day; so much so, that Watts himself told her, ‘Don’t cry. It makes your nose swell’. The weather was quite cold the day of her wedding and the list of attendees at Little Holland House reads as a who’s who of the nineteenth century: The entire Terry clan, The trio of sisters – Mrs. Prinsep – (mother of the painter), Lady Somers, Mrs. Julia Margaret Cameron, Mrs. Jackson, Mrs. Dalrymple, Gladstone, Disraeli and Browning! It is said that Pre-Raphaelite painter Mr. Holman Hunt himself designed her wedding dress – a brown silk gown and a quilted white bonnet with a sprig of orange blossom (symbolism- not rosemary?) and an Indian shawl wrapped around her (I wonder if her mother or Mrs. Cameron gave her the shawl). Years later when reminiscing of her marriage to Mr. Watts, she says, ‘I sat, shrinking and timid, in a corner – the girl-wife of a famous painter. I was, if I were anything at all, more of a curiousity, a side-show, than hostess to our distinguished writers’. After the wedding it was off to their honeymoon at a place called ‘Freshwater’ where she would meet amongst others a man named, ‘Tennyson’. ‘Tennyson was more to me than a magic-lantern shape, flitting across the blank of my young experience, never to return’. Terry recalls the first time she saw him. He was sitting at the table in his library, and Mrs. Tennyson, her very slender hands hidden by thick gloves, was standing on a step-ladder handing him down some heavy books. She was very frail, and looked like a faint tea-rose. Terry only saw her one other time lying on a sofa (re: my Emily Tennyson article for the lying on sofa explanation). It was in the evenings that Terry went walking with Tennyson over the fields. He would point out to her the differences in the flight of different birds, and tell her to watch their solid phalanxes turning against the sunset, the compact wedge suddenly narrowing sharply into a thin line. He taught her to recognize the barks of trees and to call wild flowers by their names. He picked her first pimpernel she ever noticed. She was always at ease with him because he was a simple man. Terry remembers fondly wearing a brown straw mushroom hat with a dull red feather round it that was tied under chin and she wore her hair down. 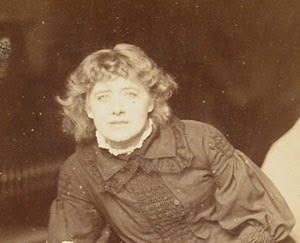 It was easy enough for such a young Ellen Terry Watts fondly nicknamed ‘Nelly Watts’ to believe that Tennyson was a poet. He showed it in everything he did. Especially impressive were his poetry readings. Fondly she remembers Tennyson reading Browning’s ‘Ride from Ghent to Aix’ better than anything of his own, except, perhaps, ‘The Northern Farmer’. He used to preserve the monotonous rhythm of the galloping horses in Browning’s poem, and made the words come out sharply like hoofs upon a road. It was a little comic until one got used to it. It was the right way and the fine way to read this particular poem and Ellen Terry never forgot it! She describes meeting distinguished people at every turn and taking no notice of them. 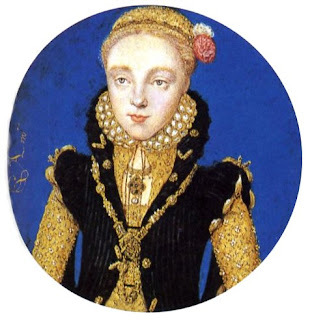 Admittedly, while still so young during her time at Freshwater, she preferred playing Indians and Knights of the Round Table with Tennyson’s sons, Hallam and Lionel and the young Camerons, to sitting indoors noticing what the poet did and said. She was proud when she learned how to prepare Tennyson’s daily pipe for him. It was a long churchwarden, and he liked the stem to be steeped in a solution of sal volatile, or something of that kind, so that it did not stick to his lips. She recalls some years after her Freshwater days but before the production of ‘The Cup’ that she saw Tennyson again. He was sitting in his carriage outside a jeweler’s shop in Bond Street. “How very nice you look in the daytime,” he said. “Not like an actress!” She told him in reply that she thought actresses looked very nice in the daytime. 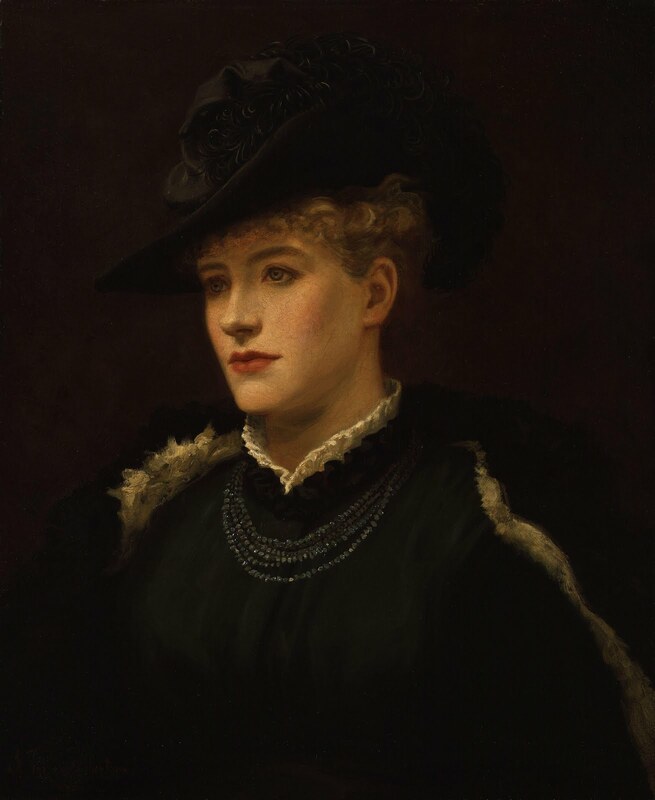 Ellen Terry’s final recollection of Alfred Tennyson came in February 1881 discussing the production of Tennyson’s, ‘The Cup’ being performed at The Lyceum with lead roles by Henry Irving and Ellen Terry. By now, an adult, Terry would be a leading stage actress in Britain, married at least three times with a son and a daughter and Tennyson would have eleven years left on this earth. Tennyson read the play to us at Eaton Place. There were present: Henry Irving, Ellen Terry, William Terriss, Mr. Knowles who arranged the reading and Terry’s daughter ‘Edy’ Edith, nine years old, Tennyson’s son Hallam and a dog named Charlie. Tennyson read in his monotone, rumbling on a low note in much the same way Shelley is said to have screamed in a high one. For the women’s parts he changed his voice suddenly, climbed up into a key which he could not sustain. As this was going on, Edy was sitting on Henry’s knee, looking over his shoulder at young Hallam and laughing. No one seemed to mind and Tennyson read on. Afterwards, there was much discussion about what the play should be called, and whether the names “Synorix” and “Sinnatus” would be confused. Tennyson wanted to call the play “The Senator’s Wife” at first then thought of “Sinnatus and Synorix” before agreeing on “The Cup” being the best and simplest title to go with. ‘Dear Camma, he answered, I have given your messages to my father, but believe me, who am not ‘common report,’ that he will thoroughly appreciate your noble, most beautiful and imaginative rendering of ‘Camma.’ My father and myself hope to see you soon, but not while this detestable cold weather lasts. We trust that you are not now really the worse for that night of nights. Her autobiography covers the years 1848-1901. She chose to write more about her life in the theatre than her life outside it. 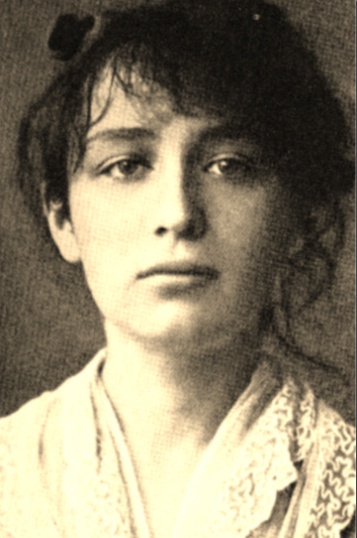 She passed away on 21 July 1928 from a brain hemorrhage while living at her home at Smallhythe Place in Kent, England. What an interesting life! She comes across as a warm-hearted and observant person in your article. I am sure she had many special qualities as an actress, too. Thank you for reading and leaving a comment Robert. I tend to agree with you about Ellen Terry. I quite enjoyed her autobiography. Thank you for reading and commenting on my article about Ellen Terry. I too was not all that familiar with her but now I have much respect for her life and the type of woman she seemed to be. Hi gigigirl, thanks for stopping by and commenting. 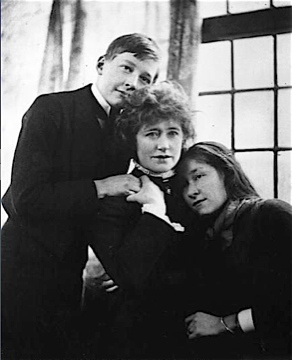 Ellen Terry lived a very interesting life considering she didn't fit into your 'typical' Victorian paradigm! I quite like her, for that! Thanks for reading my article, I'm glad you liked it! Hi and thanks for this wonderful article. Do you happen to know if there are any substantial differences between: Ellen Terry's Memoirs and The Story of my life? Thanks a lot! Hi,thanks for reading my article and commenting. Well, the main difference would be 'Memoirs' focuses on Ellen Terry's years in the theatre and provides interesting accounts about other actresses of the day, whereas, in 'Story of my Life' Ellen Terry writes about her life and loves also.